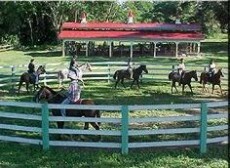 Banana Bank Lodge "Our Belize Vacation" - "Our Belize Vacation"
Banana Bank Lodge is a family run jungle lodge that has been offering Belize horseback riding vacation packages and Belize tours since 1985. Situated on the peaceful Belize River and surrounded by 4,000 acres of pristine rainforest, Banana Bank Lodge's central location near Belmopan, Cayo District puts you near all the best inland Belize adventures. 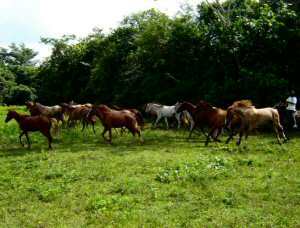 Take a look at our horseback riding and Belize tour packages. 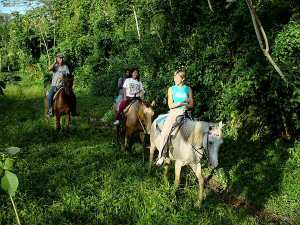 Our inclusive horseback riding and Belize adventure tour packages allow you to explore caves, climb Maya temples, be close to nature, learn about wildlife, & experience Belize culture. 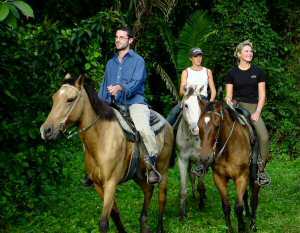 Our wealth of experience with large groups, couples, day trips and families with children allows us to adjust our packages as necessary to meet your needs. 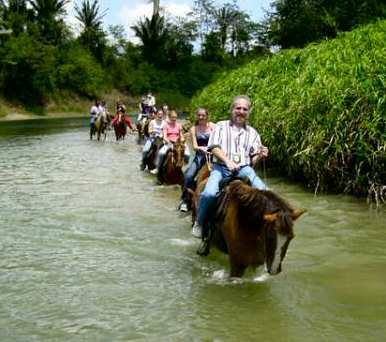 At Banana Bank Lodge our Belize horseback riding vacation packages and Belize tours will take you to a place away from the "real" world and nearer to the vacation that you have dreamed of. You will be taking more than just pictures home - you'll have memories to last a lifetime. 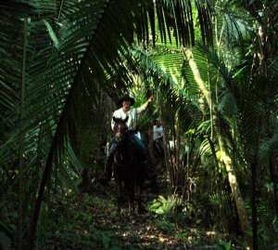 Belize all-inclusive package deals are available at our Belize jungle lodge. 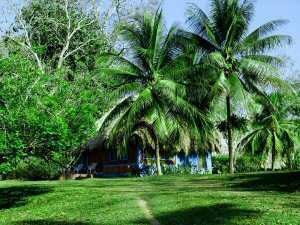 Nestled near the Belize river in a tropical jungle setting where wildlife abounds. 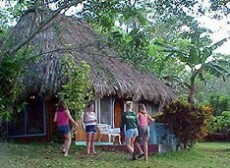 Choices of thatched cabanas. 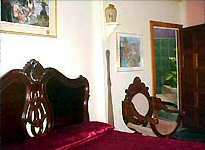 luxury suites, standard rooms or chalet are here to suit all travel budgets. 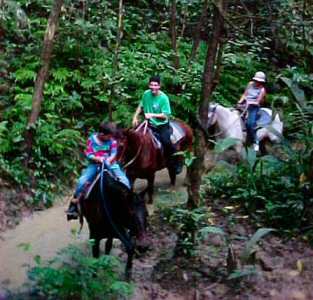 Inclusive packages make your vacation a worry-free experience. 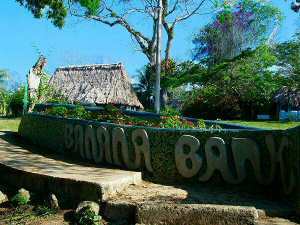 Banana Bank features delightful accommodations that blend with the jungle landscape. 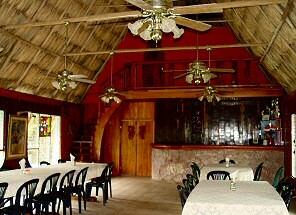 Cabanas with roofs made from jungle bay leaf thatch are uniquely designed. 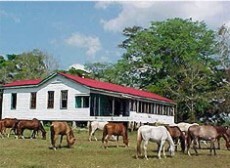 Built by Banana Bank craftsmen with fine Belizean woods, they are, in themselves works of art. 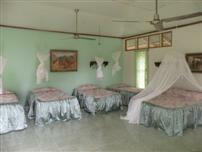 Each cabana has a solarium bath, a sitting room and two bedrooms, each with queen and single bed. Four to six family members, friends or groups traveling together can be easily accommodated in each cabana as each room has a queen size bed and a single bed. Carved doors, artwork by Carolyn Carr and jungle ambiance create a truly memorable surrounding. The dining room is full of exotic presence. 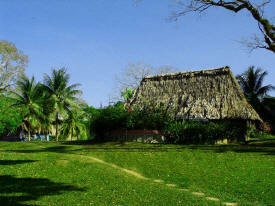 The tone is set by the soaring thatched roof. Carved banisters, pink gypsum stonewalls, and rich local hard wood paneling make this a beautiful place to enjoy. 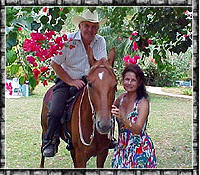 Our meals are served family style and are widely reported to be some of the best in Belize. 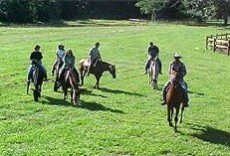 The family atmosphere provides a setting for lively discussion between guests of different locations and interest. Menus vary but center around the kind of home cooking we call "grandma food" and our girls put on some of the best cuisine found in Belize. 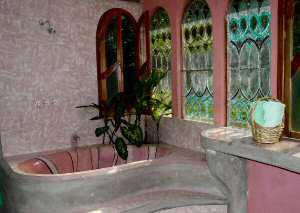 The soft rounded shape of this room with it's creamy rose color, stained glass windows, bamboo ceiling and solarium bath room make this a delightful place to snuggle in. The unique use of sea shells in a stunning mirror is another feature that lets you know this is a designed room. It has the option of a ceiling fan or air conditioning. 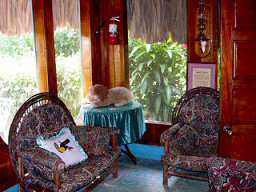 The room has a reading desk, a tea kettle for that hot cup of late night tea and a comfortable easy chair. This room has only a queen size bed. 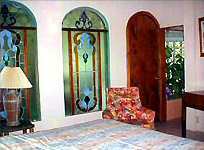 This room is a tribute to the Maya heritage of Belize. 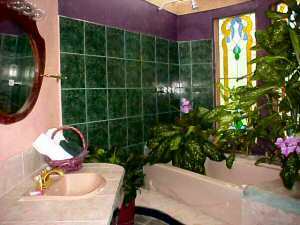 There is a Maya fresco in the bath and a solarium tub with stained glass windows. 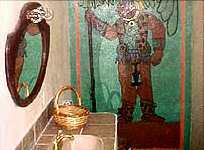 Maya pottery, carvings and paintings decorate the room. 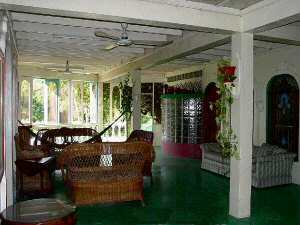 There is a ceiling fan or optional air conditioning. A tea kettle is included. This room has a queen size and a single bed. With dark burgundy lace curtains and bed spreads, the mood is set for the sensual mystery of the creole culture. Authentic accent pieces , a hand hewn paddle, a rice beater, and whisky crock take you back to the logging era. The beautiful hand carved mahogany headboard clearly expresses why so many struggled so hard to harvest this precious wood. 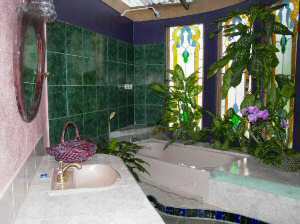 The solarium bath with the stained glass windows and delicate curves is a work of art. A tea kettle is included. There is the option of ceiling fan or air conditioning. 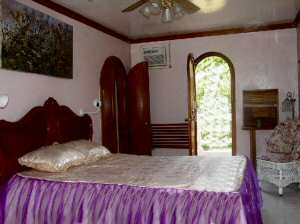 The room has a queen sized bed and a single bed. The minute you enter this room you know you are in a special place. As the name implies, it is joyous. 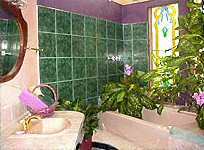 The large bath is a molded artistic expression of curves and stained glass . Rich fabric and carved furniture complete the feeling that all is right with the world.There is the option of ceiling fan or air conditioning. In this room is a queen sized and a single bed. 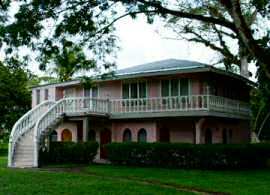 This 3 story building was designed by the owners John and Carolyn Carr. 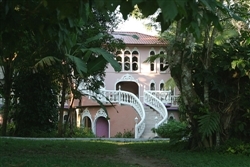 A blend of styles featuring curved stairs and a large patio can be viewed through arched, stained glass windows. 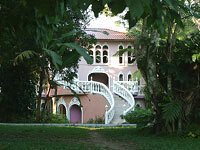 The Chateau has 3 suites and 2 standard rooms. 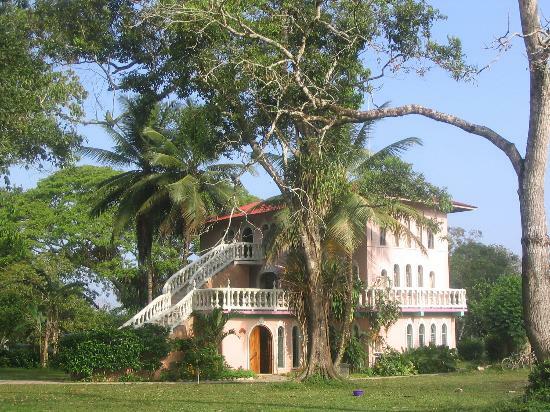 This house is also perfect for weddings and romantic getaways. A 2 story building for budget travelers. These 3 rooms have the dollar conscious in mind. 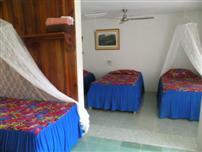 Each room has five single beds and 1 double. 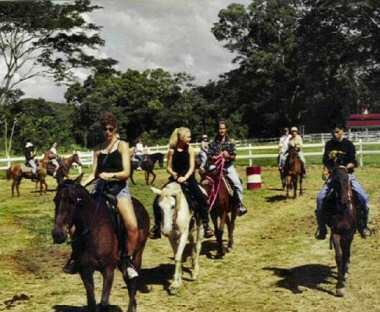 The prices are right for families on a budget, back-packers, student or specialty groups.